Wallets, or billfolds, are an essential accessory for men that can also serve as a fashion statement. Yet most men to go for the same basic design of smooth leather in dark hues with a horizontal fold. 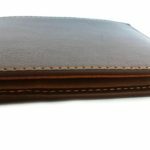 Just by simply exchanging one or two design traits, you can have a wallet that makes you stand out as a man with unique taste. Change up the material by going with steel instead of leather or cheaper alternatives. Steel makes the wallet much sturdier, making it last longer and thus offer more value. It also gives you a more modern look. Money and cards can easily fall out of wallets, especially as they stretch and wear out from constant use. A zipper or flap closure provides both extra security and style. Something as simple as changing the direction of the fold can make a significant impact on appearance. The height from the vertical fold gives the wallet a boost of sophistication. Although you can never go wrong with dark neutral colors, they can quickly become boring and unnoticeable. Add a burst of color with a vibrant solid, such as red, or a light neutral, such as white. Your wallet is a great way to show off bright colors if you don’t like to do so through your clothing and other accessories. When choosing a texture, go beyond the common reptilian theme. Try a woven or patterned leather instead. It adds another dimension to your wallet and makes it more interesting. A wallet may be small and practical, but its necessity and high usage make it an easy way to leave a fashionable impression on others. Be different and get a unique wallet that reflects your individuality.